Mid-way through its seventh season, AMC’s The Walking Dead is the #1 show on television by a wide margin for a record-breaking fifth consecutive season, averaging 16.1 million viewers per episode and 10.1 million adults 18-49 across its first eight episodes. The show returns on Feb. 12, 2017 for the second half of the season. Sunday’s expanded 90-minute mid-season finale delivered 15.2 million total viewers, 9.6 million adults 18-49 and 9.5 million adults 25-54 in Nielsen live+3 ratings, growing 43 percent in total viewers and 47 percent in adults 18-49 and adults 25-54 from Nielsen live/same day ratings. In Nielsen live+3 ratings, episode 7.08, “Hearts Still Beating,” was up 2 percent in total viewers, 3 percent in adults 18-49 and 2 percent in adults 25-54 from the previous week, the second week in a row of growth from the previous episode. Talking Dead remains television’s #1 talk show, averaging 5.5 million viewers and 3.3 million adults 18-49 in season seven. In addition to the linear viewing, The Walking Dead has generated record digital viewership of more than 14 million plays so far this half season, up 46 percent from this point last season. 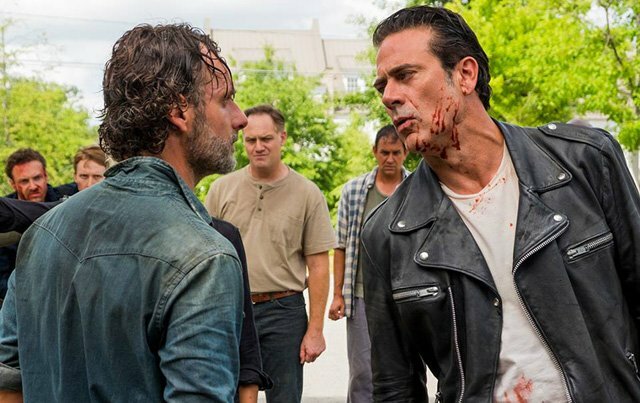 Over the first half of its seventh season, The Walking Dead has weathered linear viewership challenges better than other cable shows and much better than cable dramas. Average linear viewers (adults 18-49, live+3) across these first eight episodes decreased 10 percent from the second half of season six, while average returning series across all cable and broadcast networks declined 13 percent, year-to-date, TV dramas are down 20 percent and dramas on ad-supported cable networks decreased 23 percent. An AMC Studios production, The Walking Dead is executive produced by Scott M. Gimple, Robert Kirkman, Gale Anne Hurd, David Alpert, Greg Nicotero, and Tom Luse.